A circular from Elterwater village initially following the Cumbria Way past Elterwater itself and on past Skelwith Force to reach Skelwith Bridge. On this section there are great views back towards the Langdales. There is a cafe at Skelwith Bridge. From there the Cumbria Way is followed to Colwith Force, another delightful waterfall in some secluded woods and then on to the much photographed Slater Bridge. The walk heads on by Little Langdale, with views of Little Langdale tarn before heading back down to Elterwater. Parking: National Trust Car Park in the centre of Elterwater by the bridge over Great Langdale Beck (grid reference NY 327 047). Turn right off the A593 Ambleside to Consiton road onto the B5343, then after a couple of miles turn left into Elterwater. From the car park there is a footpath signed to Skelwith Bridge. Following this sign, leave the corner of the car park by Great Langdale Beck through the wooden gate and out onto the gravelled path. This path, enclosed by a wire fence and a wall, keeps close to the Beck and heads along in the direction of Elter Water. From this path, which forms part of the Cumbria Way, there are some excellent views behind back to the Langdale Pikes. The path crosses a small wooden footbridge and then pulls back in alongside Elter Water itself. As the path passes the main body of water, it forks with the left-hand fork heading off uphill into the trees. Ignore this and take the right fork alongside the water. Shortly afterwards pass through a wooden gate in the wall where the trees on the right end, opening up a fantastic view back over Elter Water with the Langdale Pikes in the distance. From Elter Water, continue on in the same direction, through a kissing gate, then across open parkland heading for a wooden gate near the far corner of the field, close to the road. Pass through a kissing gate just to the left of the wooden gate and take the right-hand fork, which keeps just below the wall next to the road. 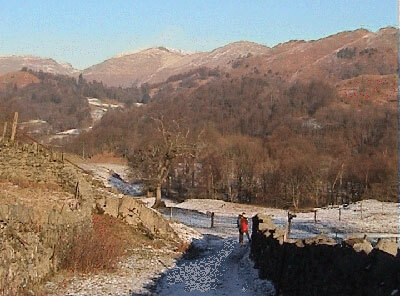 From this path a short diversion can be made down to the right, to visit a view point of Skelwith Force (waterfall) formed by the narrowing of the River Brathay. Return to the path and pass through the middle of Kirkstone Green Slate Buildings onto a metalled road, with the bridge over Great Langdale Beck directly ahead. The path bends around to the left and meets the A593 Ambleside to Coniston road. Turn right onto the road over the bridge into Skelwith. The road bends around to the right and a few yards further there is a footpath sign off to the right for Skelwith Falls - viewpoint only. Ignore this and follow the road for a further 75 yards and turn right following the green footpath sign for Colwith Bridge. After ten yards, pass through a wooden kissing gate, ignoring the private road to the right, and head along the well-defined path. The path meanders before going through another wooden kissing gate, and over a small stream before starting to climb up through the trees. The path continues along parallel with the road and meets a farm track coming in from the left. Turing right onto this track, Park Farm is soon reached. The track works around to the left of it, then passes through a metal kissing gate, down a short alleyway, then through another metal kissing gate, which takes you around the farm and out onto a path. The path undulates through the fields and meets a track which shortly afterwards passes through a wooden gate and then slowly rises. The path then bends around to the left between two walls and climbs up a short incline. At the top of the walled lane pass through the wooden gate into the yard and pass in front of Elterwater Park Country Guest House. Through the yard, the path bends around to the right around another building following the yellow sign. Then following another yellow sign, the gravelled path bends around the final building, passes in front of a driveway and keeps to the right of a barbed wire fence, whilst slowly descending. Forty yards past the house, pass over a wooden stile in the wall down to the corner of the field, over a further walled stile, down a tree lined alleyway, and out over another stile. A further ten yards on, pass through a metal gate, and keep to the path ahead, which contours around the corner of the hill ahead before passing over a stile and entering a small wood, where the path narrows before steeply dropping and passing over a stile to meet the River Brathay. The path leaves the beck and leads out onto the road, which if time is of the essence can be followed back to the car park in Elterwater. Turn right onto this road following the National Trust sign "Colwith Force and High Park 100 metres", then just before crossing the bridge which leads into High Colwith, take the path off to the left over a stile, which then immediately starts to climb up through the trees. The path climbs steeply before joining a well-defined gravel path. Turn right onto the path and continue on for a few hundred yards where the path splits. Ignore the left-hand fork that goes up some man-made steps, and take the right-hand fork which leads about fifty yards later to a viewpoint of Colwith Force. Colwith Force is about 15 metres in height and is formed by the River Brathay, which rises on the Wrynose Path. Return back round to the junction of paths, and this time take the path leading uphill, climbing the man-made steps. At the top of the steps, the path flattens briefly with Colwith Force down to the right. It then bends away to the left along a stone man-made path through the trees, before reverting back to gravel underfoot. Cross a small stream and continue on up through the trees crossing more smaller streams and over tree roots for a quarter of a mile before exiting the walled boundary through a kissing gate. Head right along the side of the wall at the bottom of the field, before turning right through another kissing gate a further seventy yards ahead. The path heads down towards High Park Farm, turns left just in front of it and joins a metalled road by way of a kissing gate, a left along a track for a few yards, and then over a cattle grid. It is at this point that the walk departs the Cumbria Way, which now heads left along this road. Turn right on to the road and follow for a third of a mile before passing through Stang End cottages and then over a cattle grid. Along this section of road there are excellent views over to the right of the very imposing Lingmoor fell. Over the far side of the cattle grid, continue on the lane over the bridge until it meets the River Brathay by a wooden footbridge. Do not cross here, but take the track off to the left, which goes along the south bank of the Brathay. After a couple of hundred yards, pass through a wooden gate with access to Holgarth only on it. Then, fifty yards past the next gate turn right through a kissing gate by a stile in the wall which leads down across a small field to the very picturesque Slater Bridge. Cross over the bridge, taking great care when wet, and head up on the left-hand side of the wall, which climbs the hill directly ahead. As the gravelled path rises, behind there are excellent views of Little Langdale Tarn down below, which sits in the shadow of the Tilberthwaite fells, Wetherlam, Great Carrs and the Pike of Blisco, the later two being divided by the Wrynose Pass. Pass through a wooden kissing gate and keep alongside the wall, before exiting through a wooden gate out onto a track by High Birk Howe. Here you can read the National Trust sign about the Herdwick sheep, which are prevalent in this area. Turn left onto the track for about 100 yards, before meeting and turning left onto a metalled road, and then take a right almost immediately. The lane passes around to the left of the farm, and continues on, all the while enclosed by walls. The lane now becomes a little rougher underfoot for about half a mile before it starts its descent back down towards Elterwater. Again, all along this lane, there are excellent panoramic views of all the surrounding hills. Further down the lane it again reverts to metalled underfoot before passing Elterwater Hall. At a T-junction turn left down past the Eltermere Country House Hotel and Restaurant, then as the road bends around to the right, cross the bridge and turn right back into the car park.